Look who I met in Gorbio village yesterday! Isn't this the cutest little car? It's a Renault Twizy, electric of course. Does 100 kilometres on a charged battery. One seat at the front and a tiny seat at the back. The owner let me sit in it - really comfortable. He loves Apple so much (me too!) he put a sticker on the back! 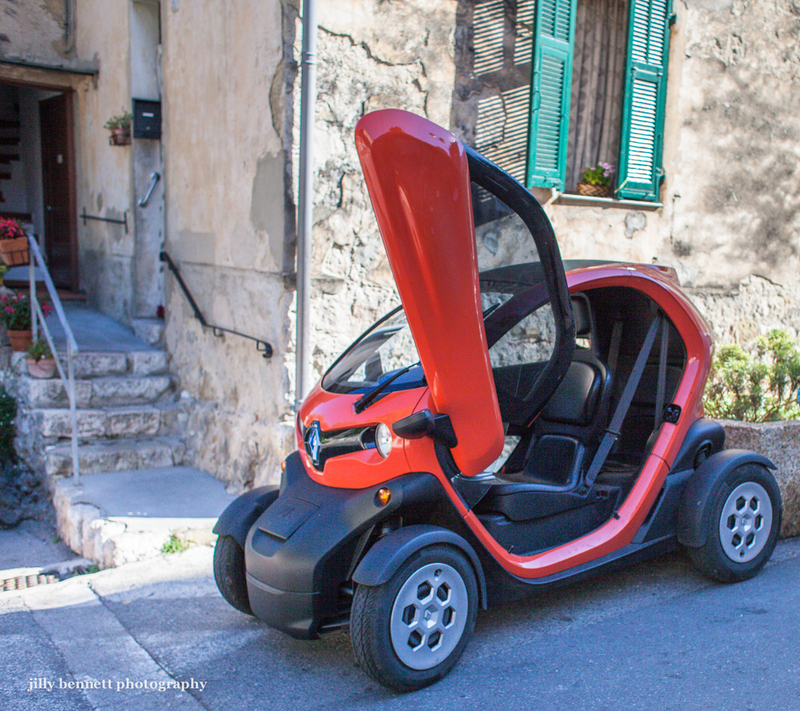 You see loads of little electric cars, of all makes, in Monaco and indeed they are really sensible to whizz around Monte Carlo but this is the first one I've seen in Gorbio. Regardez qui j'ai rencontré dans le village de Gorbio hier! N'est-ce pas la plus mignonne des petites voitures? C'est une Renault Twizy, électrique bien sûr .Elle parcourt 100 kilomètres avec une batterie chargée. Un siège à l'avant et un petit siège à l'arrière. Le propriétaire m'a laissée m'asseoir dedans - vraiment confortable. Il aime tellement Apple (moi aussi!) qu'il a mis un autocollant à l'arrière. 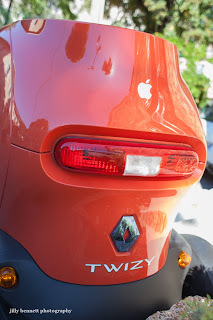 Vous voyez des tas de petites voitures électriques, de toutes marques, à Monaco et en effet elles sont vraiment utiles pour circuler autour de Monte-Carlo mais c'est la première que j'ai vue dans Gorbio. Vous imaginez quel stationnement facile! What a brilliant little car! cute but does it have a back window? when parking I would probably back into whatever was behind me. These are quite cute (Eric of PDP posted one yesterday). Not too practical in the states with all the crazy drivers on the road. What a darling car! If everyone drove one, they could have two-way traffic on the rue Longue. I know these are totally practical in Europe...but I'm glad I don't have to squeeze into it!!! 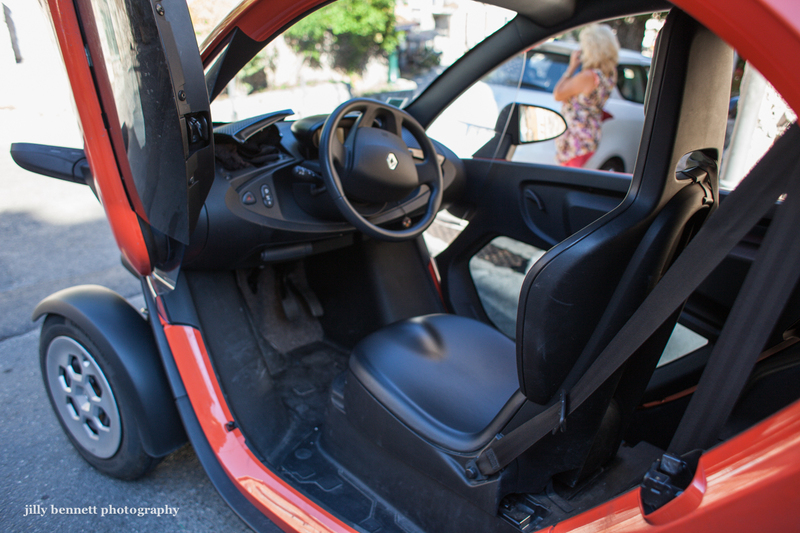 Nice Car this Twizy Jilly. Got my new 2013 Smart Cabriolet Electric last July. So funny this little car. Maybe another reason for you to come to Montréal one day to visit us, you won't have to pay gazoline! As usual, see you maybe next June !